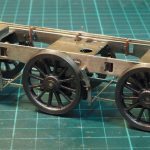 We all seem to have our own little pet peeves in model making, one of mine is valve gear. 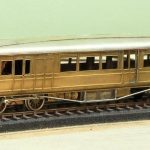 Many years ago I was lucky enough to examine a couple of O’Gauge live steam loco’s built by the “Parkers” a father and son team from Manchester. The valve gear on these loco’s was stunning, it was correctly machined and in steel and it looked just right. So I understand it is a personal thing but I find it strange when people obsess to the nth degree over paint colours getting the precise shade of green or maroon etc. but are quite happy to accept completely the wrong colour for the valve gear. 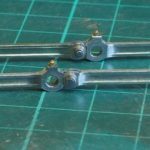 Valve gear was made from steel and no matter how hard you try nickel silver is not the same colour as steel. Second big bug bear is “profile milled rods” – milling the fluting with an end mill just looks completely wrong, the shape at the end of the fluting should flare out not end in a semi-circular hard stop. 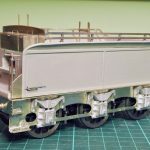 So the reason for this post – despite intending to build my JLTRT [sic] 3F out of the box – one thing I was not going to countenance was the etched rods. 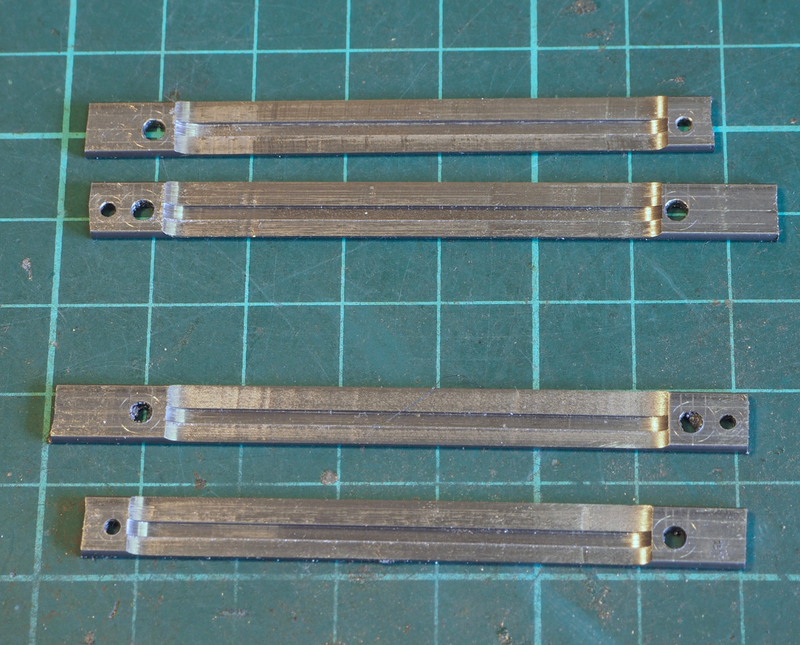 The rods are the first thing to be made for the loco chassis as I will use these to set the spacing on the hornblocks. So here we have a quick guide on how I ended up making correctly fluted steel rods. 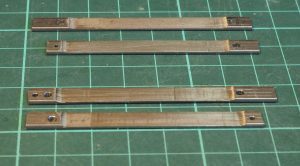 Step 1 – get a couple of lengths of steel strip 1/4″ x 1/16″ and mark out the dimensions for the rods. There were no suitable drawings in the Wild Swan book on the 3F goods engine – however there were some good dimensioned drawings in the Wild Swan 3F tank (Jinty) loco book. They looked very similar so I used these dimensions to draw out the shape. 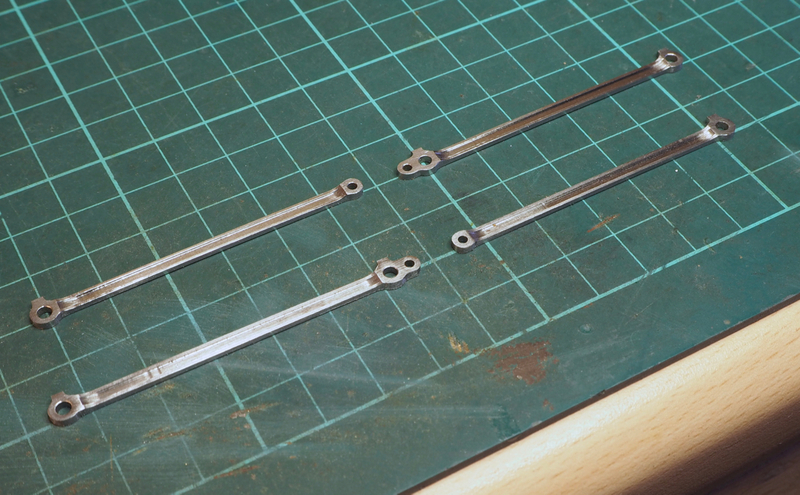 Step 2 – I then drilled out one crankpin hole in each rod and then using a steel peg used this to locate and clamp the two sets of rods together.I could then drill the remaining holes assured that the two sets of rods will match. Step 3 – first step of machining is the thinning of the rods between the crankpin bosses. 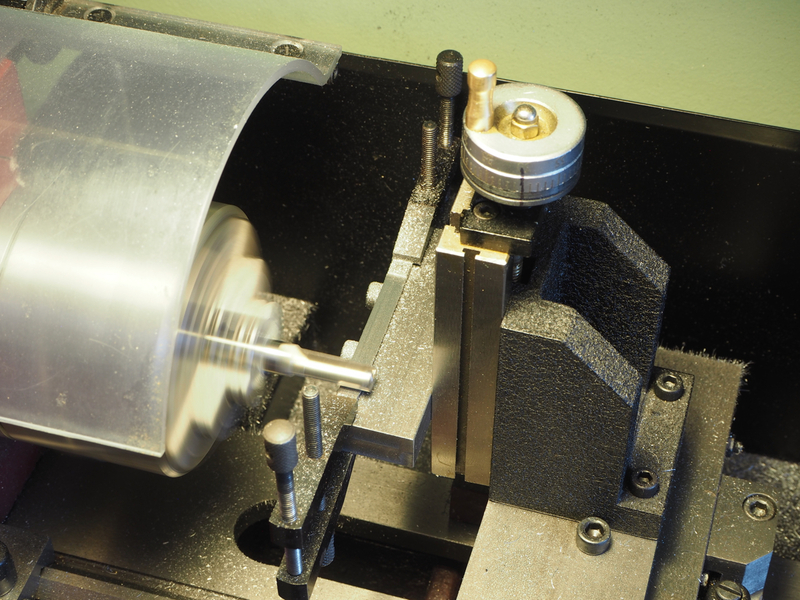 The rods are clamped on to the vertical slide in the lathe and a 5/16″ end mill is used. So now the rods look like this. 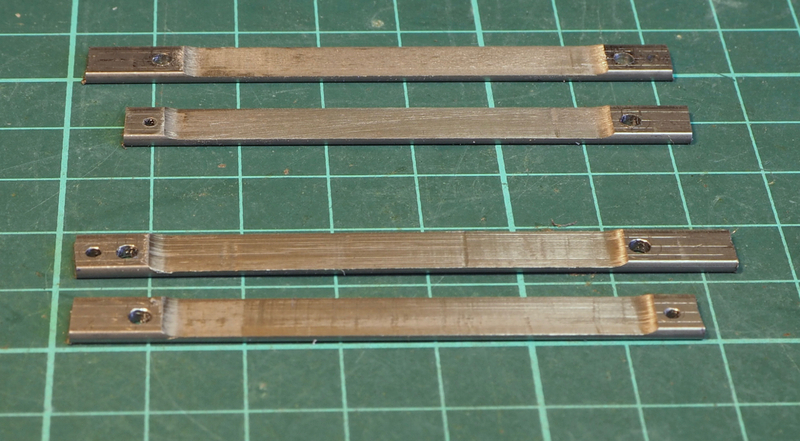 Step 4 – fluting the rods is then done using a woodruff cutter(203). It is just lined up by eye. Checking the edge of the cutter against the marked line at one end. 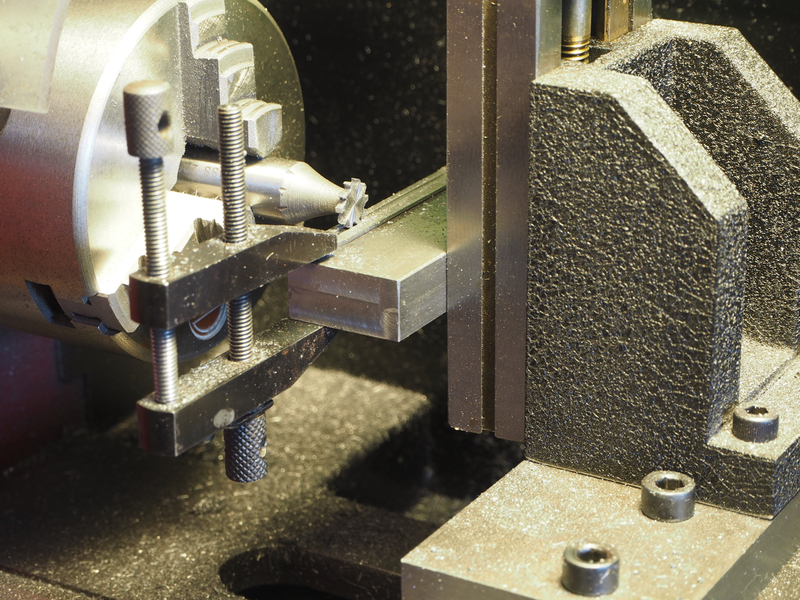 Move the cutter to the other end of the rod and check the alignment, adjusting it if required. So now we have something that looks like this, unfortunately I was slightly too enthusiastic on one of the cuts which has ended a bitt too close to the crankpin hole. 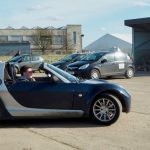 Hopefully it won’t be too noticeable when fitted. Step 5 is cutting out the rods. 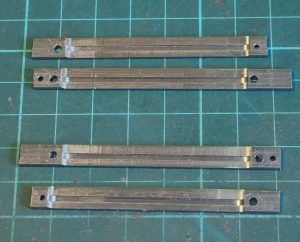 it would have been nice to mill out the rods and bosses on a milling machine but I don’t have one (yet!) so it was done the old fashioned way – by hand. First rough cut out using the piercing saw. Step 6 – final finishing with files. I made a couple of little filing buttons to provide a guide for filing the bosses, surfaces were then draw filed and burnished to end up with this. Step 7 – making the forked joint. The knuckle joint is forked, one method is clamping the rod in the lathe and using a slitting saw but I didn’t have one thin enough. So the slot was made by hand and this was one of the most stressful bits, I tried using the piercing saw on a bit of scrap but a single cut was too thin. So after a little trepidation and a couple of test pieces the slot for the forked joint was made with a junior hacksaw! The main rod knuckle joint was thinned down for the forked joint. The joint is drilled and reamed 1/16″. I then turned up a brass top hat bush and at 1/16″ it is just possible, although it’s cutting it a little fine, to drill a 12BA clearance hole. Tight – it’s a 51 thou hole in a 62.5 thou bush!! 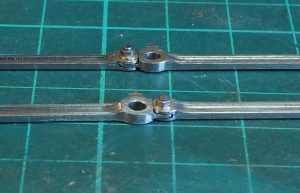 :eek: I then use a 14BA steel nut drilled and tapped 12BA. So the assembly is a 12BA steel countersunk bolt from the rear, brass bush and 14BA steel nut. The bosses were then drilled and fitted with Scale-hardware bolts. 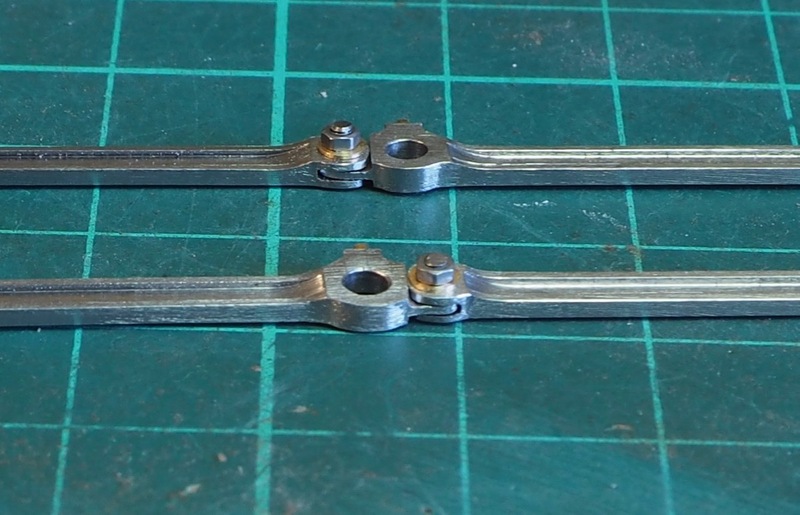 So now I have a completed set of rods I can use these to start on the chassis of the 3F.